Union County is home to a myriad of great hiking trails! Union County is home to a myriad of trails for hikers of all skill levels. You'll find trails in Meeks Park, Vogel State Park, Brasstown Bald, the Appalachain Trail, and more! The Appalachain Trail - Hike on the legendary Appalachian Trail (often abbreviated AT) via the historic Walasi-Yi Center at Neel Gap. It’s the only place where the 2,189- mile-long trail passes through a man-made structure. Moderate to strenuous. Arkaquah Trail - This is a 5.5 mile high ridge trail between Brasstown Bald and Track Rock Gap. Moderate to strenuous. Bear Hair Gap Trail - A 4 mile loop withing Vogel State Park. Great to bring the dogs. Moderate. Benton MacKaye Trail - This 288 mile trail passes through 3 states - Ga, NC & TN. The hike begins on Springer Mountain in GA and ends at Davenport Gap in the Smoky Mountains. Moderate to strenuous. Brasstown Bald Trail - Climb to Georgia Highest Point, Brasstown Bald. This 1.2 mile trail is paved, but steep and ends at the Visitor Information Center at the summit. Byron Herbert Reece Access Trail - This 0.7 mile trail is the AT access trail at Neel's Gap. It leads to stunning views atop Blood Mountain and is a fairly easy hike. Moderate blue blaze trail. Cooper Creek Trail - This 1.7 mile loop located in the Suches area. Popular location for camping with plenty of water, but limited facilities. Moderate. Coosa Backcountry Trail - This 12.5 mile hike is a loop trail in the rugged mountains near Vogel State Park. The Trail is moderately difficult and requires a permit that you can get at the Vogel State Park Visitors Center. Dockery Lake Trail - This 3.5 mile hike or 7 mile loop begins at Dockery Lake Recreation Area near Woody Gap and GA 60 South, to intersect with the AT at Miller Gap. Moderate to strenuous. Duncan Ridge Trail - This 31 mile trail begins near three Forks and ends at the AT south of Blood Mountain. Moderate to strenuous. Eyes on Wildlife Trail - This hike is a 1.2 mile fun loop trail that has scenic stops offering great views, and as the name implies, the opportunity to see lots of wildlife. 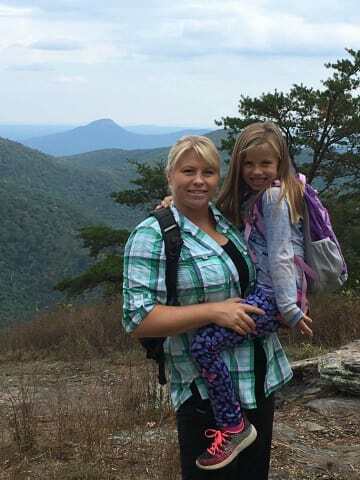 Freeman Trail - This 1.8 mile hike winds around the south slope of Blood Mountain, connecting with the AT at Bird Gap and Flatrock Gap. Moderate blue blaze. Helton Creek Falls - A brief 0.2 mile hike through a cool mountain cove to two waterfalls, both of which are on Helton Creek. An observation deck at the second falls gives hikers the opportunity to take a rest and enjoy the serenity of the waterfall. Easy. Jacks Knob Trail - Built by the Civilian Conservation Corps as access to Brasstown Bald, this 4.5 mile trail climbs to the top of Wolfpen Ridge. Jarrard Gap Trail - Starting at the Lake Winfield Scott recreation area (in Vogel State Park) and leading to Jarrard Gap, this 2 mile trail crosses streams and access to the AT. Moderate blue blaze. Lake Winfield Scott - Short 0.4 mile trail around the lake. Easy. Logan Turnpike - This 4 mile trail may see easy at first, but the last mile climb to the Appalachian Trail is difficult. The Logan Turnpike trail is strenuous and connects to the AT at Tesnatee Gap. Meeks Park Trails - Over 4.5 miles of scenic walking trails. Easy. Mill Shoals Trail - Mill Shoals is a fun 2.4 mile trail, without a lot of hard walking or scenic views, but it features a stream and makes for a nice hike for beginners. Slaughter Creek Trail - Probably the easiest access trail to the AT in Georgia, and many hikers use it for access to Blood Mountain. This 5.4 mile trail can be combined with Jarrard Gap for a longer hike. Sosebee Cove Trail - This short 0.5 mile trail accessed from Ga 180 features large second growth trees and spectacular sping wildflowers. Easy. Wagon Train Trail - Beautiful, well banked 7 mile trail that walks more like a road. Great for those looking for a longer, less strenuous hike in the area. Yellow Mountain Trail - Yellow Mountain is a well marked, 6 mile trail that offers hikers scenic views and access to campsites. Avoid building fires when possible. When fires are necessary, use existing fire rings to make small campfires in safe areas using only downed wood.